At the heart of my work is a fascination with artifacts, culture and color. I seek objects that transcend time and culture and work to translate their truths into a modern expression through a variety of mixed media – paint, pastels, clay and sculptural surface treatments. My use of color of is directly related to time, which creates art and is one of the greatest artists, taking me as its partner to uncover the beauty in the mundane and the holy. View archives of Wendy's Newsletter and Subscribe! Wendy Gell is best known for her sumptuous costume jewelry, particularly her "wristy" (a wide, bejewelled cuff bracelet), which has been worn by movie stars, supermodels and television personalities. 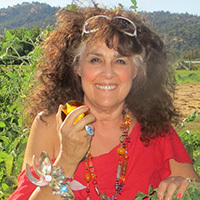 Wendy and her jewelry have been featured on the Oprah Show and numerous fashion magazine covers. Wendy is also a painter and creates mixed media collage pieces encrusted with jewels and found objects, which she calls "Gelastic Art." 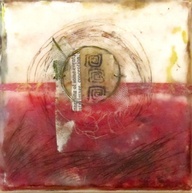 A mixed media artist, I am inspired by the natural history of the mountains and river lands in Southern Oregon. I love collage and book arts and have shown my art throughout the US and locally at Illahe Gallery in Ashland and Paschal Winery in Talent. I have been published in online collaborations and art zines, nationally in Cloth Paper Scissors, and I'm a featured artist in "The Pulse of Mixed Media" by Seth Apter. I also teach and design art workshops. Under the wing of "Lefty" Dimaggio, Curtis Keeler was given scrap wood, guidance and a few tools to build with as a youth. A 30+ year career in carpentry evolved into a second career designing and building cabinets and furniture pieces with the accent on primitives. He is a veteran trained as a Photographic Interpretor/Cartographer and served in Viet Nam. Widely recognized as a Master Carpenter/Craftsman, Curtis has worked on projects for Clint Eastwood, Paul Anka, Doris Day, the "Doc" Ricketts family, and The Whaling House in Monterey. Curtis currently paints daily. 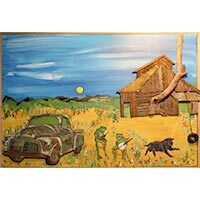 Know a Southern Oregon artist producing fine art collages who you expected to find here? Share this page on your favorite networking service so they can check it out! Don't forget to check out our blog, Art Matters! for art news and updates from our listed members. 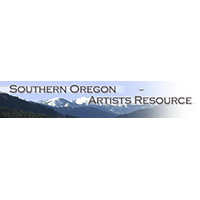 View a calendar of Southern Oregon art events here.